UAB Ustukiu Malunas is a SME founded in 1992. The Company’s business is in cereal processing and trade. The Company also works in confectionery and in the feed production area. It is also specialized in ecological cereal products made of various grains and used in breadmaking, brewery, feed, dairy, confectionery and the meat industry. The Company has the EKOAGROS certificate for ecological production and has several awards for its ecological products. In 2000 it received an award - winner of the Competition of Successfully Working Enterprises in Lithuania; in 2001 - Best product of the year; in 2001 - “Agropanorama” grand prize; in 2004 - “Ka pasesi” Grand Prize; in 2005 - ICC Poland award. The Company takes part in various local and international exhibitions and fairs in Lithuania, Latvia, Estonia, Poland, Russia, Germany, Belgium and France. There products are exported to Latvia, Estonia, Poland and USA. There are three milling departments at the UAB Ustukiu Malunas, where different cereal products can be produced. In these departments wheat, barley, rye, oat, peas, maize, rice, buckwheat, etc. can be processed. 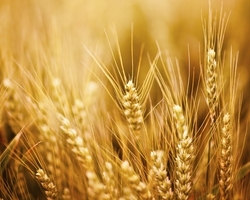 The company is therefore an excellent candidate as to provide samples of wholesome and diseased cereal grains. The company has a laboratory for cereal research, where analysis of received cereals can be performed.